Hidden in the heavy populated residential area of Damansara Perdana is Yuzen Japanese Restaurant in Plaza Emerald North, an authentic Japanese restaurant serving up some of the best Japanese cuisine in the city. Yuzen’s location is fairly discreet but foodies know how to hunt this restaurant down, especially if the restaurant is as good as this one. Walking into Yuzen Japanese Restaurant, the ambience is simple and dressed with modern contemporary design with touches of Japanese influence. There is a small sushi bar at the back of the restaurant but it is only to catch some live sushi actions rather than to dine at the bar. 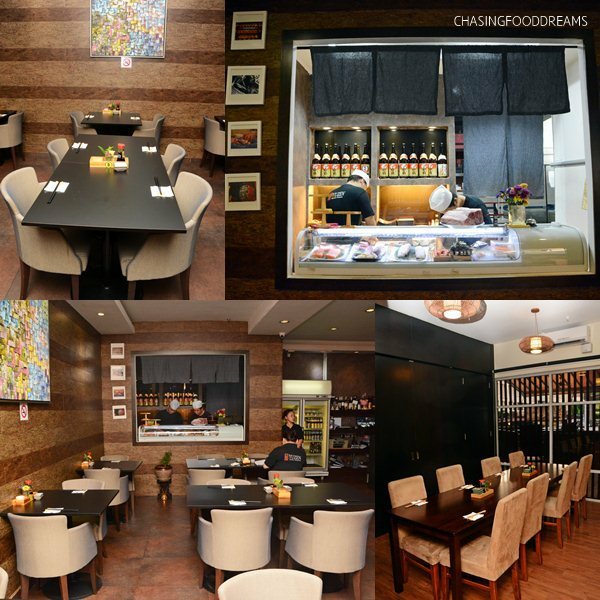 The restaurant is fairly spacious and there is another sectioned off area for few private rooms for more privacy. The owner, Mr. Matchi has over 15 years of culinary experience in Japanese cuisine and goes all out in serving up some of the very best catch of the sea in Yuzen. The menu at Yuzen is decent and sufficient with many popular Japanese classics together with a list of beverages of tea, sake, beer and soft drinks. Yuzen also offers specials of the day, Omakase sets, dinner sets and air-flown highly prized Japanese produce such as Wagyu, Toro and more. We had their Omakase Sashimi and were thoroughly impressed at the quality of the sashimi that evening with cuts of Fatty Tuna (Toro), Yellowtail (Hamachi), Horse Mackerel (Shima Aji), Sea Urchin (Uni), Hokkaido Scallop (Hotate), and Salmon Belly. The Toro, the ultimate cut of the tuna with high fat content, was gorgeously superb! It was simply irresistible. Marbled with light pink and white flesh, the Toro melts-in-the-mouth with glorious creamy notes. The Shima Aji was also another delight, firm and creamy with moreish flavours of the ocean while the Hamachi is gloriously sweet and luscious as well. The others like Uni, Hotate and Salmon Belly are also very fresh and delicious. I was in heaven for a few moments while savoring this platter of sashimi. It’s quite a hefty price tag but well worth every bite! Tuna Tataki is a fairly common dish in Japanese cuisine but this one had a lovely twist of being paired with an avocado salad in wasabi sesame dressing. The tuna was nicely seared on the outside and left raw in the middle. On its own would have been tasteless but after savoring this with the aromatic and creamy sesame dressing kicked up with hits of nostril-tingling wasabi, it was a really good dish. The fresh slices of avocado also added a nice creaminess to the overall dish. Chawan mushi may be a simple dish but it is always a much sought-after dish by every one of all ages. This one is nicely steamed with a smooth and creamy custard-like consistency. Going the extra mile, the chef topped the steamed egg with a lovely sweet mount of crab meat cooked in savory broth. One can opt for the crab meat or seafood or simply as its original. Chef Matchi makes his own teriyaki sauce so this Salmon Teriyaki is another signature of the restaurant. The fish is nicely seared and was cooked till medium well. It has a nice creamy texture and the teriyaki sauce compliments the fish very well. The sauce had a good balance of salty and sweet notes. We enjoyed the Dragon Unagi roll very much with its splendor of caramelized sweet grilled eel over the roll stuffed with prawn tempura, shredded lettuce and masago. 6 piece per order, we were happily fighting over the roll as it was moreish, lightly sweet and smoky with a nice textural bite. Dinner ended with simple Mochi Ice Cream served with red bean paste and a drizzle of dark sweet chocolate sauce. Yuzen Japanese Restaurant serves premium quality Japanese food set in a simple and elegant ambience. Prices are reasonable as certain ingredients are imported by air such as the sashimi. If you’re looking for authentic Japanese cuisine, Yuzen is an ideal choice for an authentic Japanese meal. Book with Offpeak.my! Offpeak.my is an online platform that helps diners save money and time when booking great restaurants online. Once a restaurant is available in the Offpeak.my directory, you can simply book and enjoy unlimited discount on your favourite restaurant, every day, anytime. I just love this blog.t=Thanks for sharing.